This article provides you with an overview of our committees, building on updates from past MEC communications, including Facebook and other mediums. Our ARW ALPA volunteers do an incredible amount of “heavy lifting” for our pilot group, ALPA, the MEC, and Air Wisconsin (that’s right, we’re trying to help Air Wisconsin become a better company). While it’s important for you to know about the work that’s being done, it’s equally important for you to understand the role each committee has in helping the MEC fulfill its mission. This is a summary of the work of your fellow line pilots who are ALPA volunteers. In May, CIRP Chairman Aric Newstedand FOQA Chairman Ron Stockirecorded committee updates for the pilot group. These and other outstanding podcasts are available here, and iPhone users can download the ipadio podcast app here and search for “Air Wisconsin Pilots.” The ARW MEC, CASC, and CIRP want to stress to the pilot group that rushing into an Event Review Debrief may not be the most prudent action. Take time to decompress, and wait at least 30 minutes after deplaning prior to making any fit for flight decisions in the event you have had an incident requiring you to declare an emergency. Do not let FAR 117, Day 4 blues, or others rush your decision-making process. You must remind yourself that the FAA has placed its trust in the judgment of the PIC to make the right decision in the interests of safety. Since May 1, 2013, Air Wisconsin has outsourced the administration of family medical leave and other leaves of absence cases and requests to CIGNA Leave Solutions. If you are going out on short-term disability, Aeromedical Chairman Jack Roback asks that you contact him after your paperwork is fully and properly completed and submitted to CIGNA. He will make sure that CIGNA and the Company expedite approval for short-term disability benefits and ensure that they are handled properly. In addition, if any pilot has problems with CIGNA, please e-mail Jack at Jack.Roback@alpa.org. We have turned back on the short term disability bank as the balance is down to nearly $40,000. The ASAP Committee is comprised of Chairman Dan Lehenbauer and Secondary Representatives Chris Fuson and Marlena Mattingly. Due to the confidential nature of this committee, the exact details of their work are not reported to the MEC or the pilot group, and are protected under federal regulations and the ASAP Memo of Understanding. Nevertheless, this “behind-the-scenes” committee provides prolific service and enormous safety benefits to our pilot group, our company, and the airline industry. As of June 4, 2014, the ASAP Event Review Committee (ERC) has 15 new reports in WBAT (Web Based Application Tool), including 35 old reports and 13 reports that will soon be processed and closed by the ERC. This will leave 37 reports to be evaluated by the ERC, which is a satisfactory quantity. The ERC held a regular meeting via telecom on May 14, 2014. FOQA Committee Chairman Ron Stocki reported in April that due to an oversight by the Air Wisconsin Safety Department a new event definition was not sent to IATA (the FDR analysis vendor) in a timely fashion, causing a delay to their monthly report. Since the FOQA Committee didn’t have that report, the April FMT (FOQA Monitoring Team) meeting was cancelled. The new event definitions that caused the cancellation of the April FMT meeting have been cleared up, but not in time to get a report for the May meeting, which was additionally cancelled. Grievance Committee Members Graham Downing and Ken Nesbitt are now in charge of the Issue Form Branch of the Grievance Committee. If you receive a call or e-mail from Graham or Ken regarding your issue form, please make their job easier by calling them back or responding to their e-mail as quickly as possible. Issues are resolved through an organized and time-critical process during which the filer of the issue form needs to be actively engaged. Also, when filing an issue form, provide as much detailed information as you can about the alleged contract violation. Please include a copy of your schedule, a description of the event with applicable names and times, why you believe the contract has been violated, and under what section. Grievance Committee Chairman Maggie Eickhoffwants to remind pilots to submit issue forms if they do not concur with an FDP extension and are forced into a fatigue call. The MEC has filed a group grievance on behalf of all affected pilots. Maggie is also administering emails sent to the Grievance Committee regarding the ACARS data request. Jumpseat/Security Committee Chairman Nick Chichesterrecognizes and thanks his committee members Leon Provencher and Dave Barnes for their outstanding efforts to lead the committee and continue the work while Nick was out on FMLA after the birth of his child. Also, the MEC and JS Committee thanks Dave Barnes for his exceptional work in helping the ARW pilot group, and wish him all the best as he begins the next step in his airline carrier at Delta Air Lines. During May, the Committee handled issues and questions about jumpseat priorities, and reports that the main airports with issues were Charleston, SC and once again, Charlotte, NC. The JS Committee is also in the process of getting the pilot group reciprocal jumpseat agreements with Southern Air, Centurion Air Cargo, and Xtra/Casino Express. These agreements should be finalized in June and will allow Air Wisconsin pilots access to more options for domestic and international travel. Legislative Affairs Committee Chairman Brendan Cantwell and Vice Chairman Jeffrey Woodhamattended the second annual ALPA Government Affairs Legislative Summit on May 28–29, at the Hyatt Regency Capitol Hill in Washington, D.C. The summit provided pilot representatives and pilot advocates an opportunity to enhance their advocacy and PAC leadership skills through hands-on training. Participants developed the tools needed to become effective advocates and to grow participation in ALPA’s PAC and grassroots programs within their pilot group. This is an excellent opportunity designed to enhance legislative/political abilities. The summit featured legislative briefings, workshops, guest speakers, and a Capitol Hill reception with members of Congress and staff. The program culminates with a lobby day on Capitol Hill where participants applied their training in meetings with representatives and senators on relevant pilot partisan legislative issues. Brenden was able to meet with staff from Senator Mark Warner’s office to discuss NAI, and Jeffrey made visits to his own members of Congress. On behalf of ALPA, Brenden attended Main Street Republican Awards dinner, where he had the opportunity to socialize with members of Congress and discuss issues currently facing our profession. In addition, Brenden participated as a speaker for ALPA’s Level Playing Field Press Conference on 5/29, which can be viewed on ALPA's YouTube Channel by clicking here.Brenden represented the FFD pilots along with Lee Moak, and pilots from Fedex and Delta. It’s Official! Both Mesa and PSA now have a higher number of PAC contributors than Air Wisconsin. ALPA PAC - ALPA National could not have made it any easier for you to voice your support for our profession – it’s so easy that you would have to try to not care about your future and choose to ignore your responsibility to secure it. If you want to change the industry, secure your profession and influence changing the federal rules, regulations, and policies that affect you and our profession, then you need to help ALPA effect change by donating to ALPA-PAC. Now is the time to donate to help secure your career and the airline piloting profession - the future of this industry and our careers will be won or lost on Capitol Hill. Membership Committee Chairman Brian Gambino asks all pilots to check with their fellow pilots to confirm they are receiving ALPA communications. If they are not, please have them contact the Membership Committee at ARWMembership@alpa.org so that we may remedy the situation. Training and Testing Member Erik Johnson and CIRP Chairman Aric Newstedattended meetings in both MKE and ATW to discuss AQP and New Hire pilot training. Scheduling Committee Chairman Tybee Halter would also like to remind all pilots to be firm, fair, and friendly when dealing with Crew Scheduling. Follow the guidance on the back of your ARW ALPA badge backer and remember that you are on a recorded phone line. Please report all issues to your Scheduling Committee, even if the issue was satisfactorily remedied by Crew Scheduling or a flight manager. If the issue was unresolved, file an issue form. If you do not have a badge backer, please contact Membership Chairman Brian Gambino at 516-263-4735 or ARWMembership@alpa.org. The Scheduling Committee would like reserve pilots to email ARWScheduling@alpa.org when the Company extends their FDP via ACARS on the last leg or after their FDP has ended. In addition, pilots who have a 30 minute or less extension should also email the committee. Also, it is very important that these pilots file ASAP reports so that the Company, ALPA, and the FAA are able to review these situations. The Professional Standard Committee maintains the professional standards of the pilot group. The committee serves in an advisory capacity on competence problems and handles all problems of a professional and ethical nature that are related to our pilots’ careers. Professional Standards Chairman BG Garner would like to remind our pilots that the committee does not deal with third party information, and that the services of Pro Stands should be sought out voluntarily and on a first hand basis. On behalf of the MEC, I would like to thank all of our volunteers for their dedication. Much of the progress experienced and many of the goals realized by ARW ALPA are achieved as a result of the ongoing efforts of your volunteers. Thank you. Spirit Airlines has added the ability to list for the jumpseat online. Although not required, it does help out the gate agents. It will still be first come-first served for priority; meaning priority will be given to whoever is at the gate and checked in first. To list, please go to www.spirit.com, click on "Team Travel & OA Travel/Jumpseat." From there click on "Other Airlines." At that point you will need the "Verification Code," which is nklist14. Listing isn't mandatory, but it will make your commute much easier. Below, is a link that will take you to a webcast of the American Airlines Group Inc. Annual Shareholder Meeting that was held on Wednesday June 4, 2014 at 9:00 a.m. EST. To access this webcast you will need to enter your name and email address. Although you are welcome to listen to the entire meeting, please forward to the 4 minutes 30 seconds where you will hear a proxy for an American shareholder asking Doug Parker to justify the American Eagle Envoy pilot contract offer. During the Regular MEC Meeting in YUL, the MEC elected F/O Charlie Mader to serve as the Training and Testing chairman to complete the term ending August 24, 2014 vacated by F/O Robert Thomas; and was subsequently elected to start a two year term beginning August 25, 2014. The MEC is grateful to Charlie for stepping forward to chair this important committee that promotes pilot advocacy, Training Department oversight and support, and pilot and industry safety. In July 2010, Charlie was hired with Air Wisconsin, has been based in ORF since that time, and lives in Virginia Beach. Charlie started working in the training department in Jan 2012, and initially worked briefly with Mike Melotte on AQP curriculum development. Fittingly, he started teaching new hire ground schools; a capacity he continues to enjoy and serve in. Charlie grew up in WI and earned a two year degree in aeronautics from Fox Valley Technical College, where he subsequently flight instructed for a year and a half. Accordingly, he earned his bachelor's degree from the University of Wisconsin - Oshkosh in Dec 2012. In Charlie’s own words “I joined the training and testing committee in December of last year and I am both excited and humbled to be taking over the role of chairman that Robert Thomas executed so well before moving on to his new role of assistant chief pilot. Our training department is currently facing a variety of complex challenges and I look forward to working with the other committee members and the training department staff to address these challenges and continue to uphold Air Wisconsin's reputation for producing top quality pilots”. In the weeks since the election, Charlie has named F/O Aric Newsted to serve as the vice chairman of the Training and Testing Committee. Aric also serves as our Critical Incident Response Program chairman, and like Charlie is a tireless safety, training, and pilot advocate. Please join the MEC in welcoming Charlie to the leadership of Training and Testing Chairman, and thank him for volunteering. During the Regular MEC Meeting in YUL the MEC elected CA Dan Shtarker to serve as the Uniform chairman to complete the term ending August 24, 2014 vacated by CA Jennifer Place; and was subsequently elected to start a two year term beginning August 25, 2014. 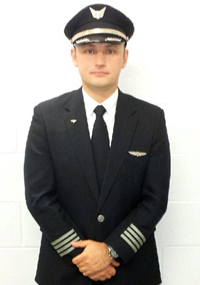 Daniil “Dan or Danny” Shtarker was hired with Air Wisconsin Airlines in July of 2007, has been a captain for the last six months, and has lived in Hallandale Beach, FL since 2009. 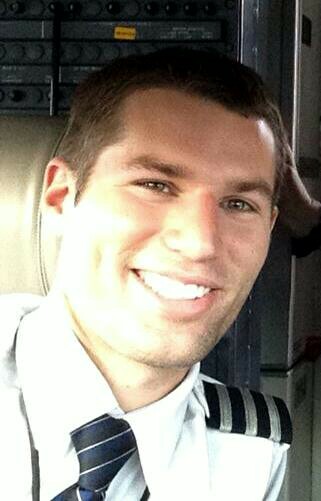 Dan graduated from Pan Am International Flight Academy in 2005 with Private through MEI certifications. While instructing for two years, he graduated from Community College of Beaver County with an Associate of Applied Science Degree in Professional Pilot in 2006. In addition, he is currently enrolled at Liberty University School of Aeronautics pursuing a Bachelor of Science degree in Aeronautics with a projected graduation date of 2015. In Dan’s letter to the MEC when running for the position of Uniform Chairman he stated “I can’t emphasize enough how important uniforms are in our profession. Our uniform not only should make us feel proud but also have an imposing effect on others. The presence of a person in uniform can change the mood of people around us. I wear my uniform proudly as it represents my position at Air Wisconsin Airlines. I think ALPA and our uniform have one thing in common; they both unite us as pilots”. Please join the MEC in welcoming Dan to the Uninform Committee, and thank him for volunteering. If any pilot has identified a particular flight(s) where you feel that you were harmed by this change, please send that identifying information to us as soon as possible to ARWGrievance@alpa.org. Include all scheduling information in the body of the email and your last name along with ACARS 7.6 Data in the subject line of your email. We will compare your data with that given to us by the Company so that we do not miss anyone’s events. It is our hope that we will be successful in identifying every instance in which a pilot suffered harm for the period of July 2012 through February 2014 by the Company’s change to using ACARS times from the past practice of using DBB times. Please see the attached ALPA National FASTread for more details. Look for additional information soon. The ARW Hotel Committee is conducting a crew hotel survey and would like your participation. To take the survey, please click here. The "ARW Hotel Committee Survey," will only take a couple of minutes to complete, does not require a login, and will provide valuable information that will guide the direction of the Hotel Committee when evaluating and selecting crew hotels.